The ZZ plant as it is commonly called is simply the abbreviation of its Latin name. It has been termed as the Plant of the Year by nursery association in the US.
" In fact, ZZ is so impressive that is was named a Florida Plant of the Year by FNGLA (Florida Nursery, Growers & Landscape Association) in 2002 and 2009. 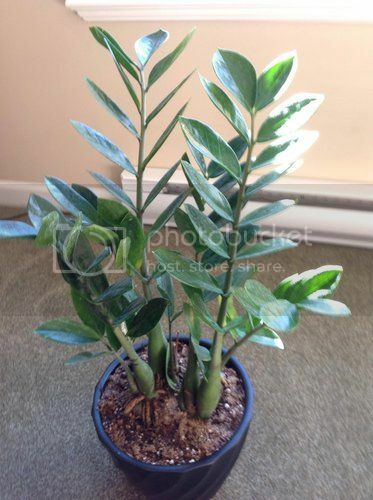 ZZ is a great houseplant for new gardeners because it will tolerate conditions that other plants will not. While it grows best in bright, indirect light, it will also tolerate extremely low light levels that would challenge other plants. It can survive periods of drought, but will perform better with moderate watering every week or two. However, do not to let the roots sit in water or else the plant may rot." Take a picture and show it to the nurseryman. Quite common plant. Nobody would recognize it if you tell them the botanical name.